It was a calm Friday morning as Frederick (Rick) Cieri ’17 put the finishing touches on a class assignment in Bird Library. The week was wrapping up and the Waterloo, New York, native was looking forward to heading back home for the weekend to help celebrate his grandmother’s birthday. Casually checking his email, one message instantly stood out—an email that would dramatically change the course of his academic life. Cieri had been named a recipient of a 2016 Boren Scholarship. The highly competitive award will allow the international relations and modern foreign languages major spend his entire senior year studying Portuguese and Brazilian Studies in São Paulo, Brazil. Funded by the National Security Education Program (NSEP), Boren Awards for international study provide exceptional undergraduates the opportunity to study less commonly taught languages in world regions critical to U.S. interests, including Africa, Asia, Central and Eastern Europe, Eurasia, Latin America and the Middle East. Following their cultural immersion, scholars then agree to work in a qualifying national security position within the United States federal government for at least one year. 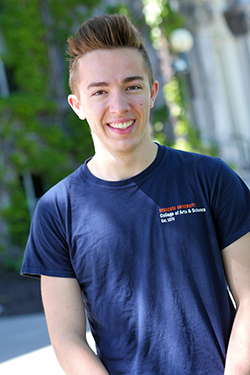 The College of Arts and Sciences Communication team caught up with Cieri, before he heads south of the equator to begin his yearlong adventure, and asked him a few questions about his experience here at SU and his outlook for the future. What are you most looking forward to during the upcoming year abroad? I am very excited to acquire another language and to experience a culture that I have never been able to explore, academically or otherwise. I am also eager to see how the 2016 Summer Olympics will reshape Brazil and how the current political changes will affect this developing country long term. What inspired you to follow this particular area of academic study? I became interested in foreign languages when I started learning Spanish in school eight years ago. I found my passion for acquiring new languages and soon began taking courses in French and Spanish concurrently. I also wanted to find a way to better the world. During my freshman year at Hobart and William Smith Colleges, I gained an interest in minority studies and a concern for minority groups’ rights. This interest soon transformed into a concern for human rights protection, particularly the law around human rights on a global level. When I transferred to Syracuse University for my sophomore year, I picked up my international relations major, and I have truly enjoyed the curriculum since. Was there a specific faculty member(s) that made an impact your academic career during your time at Syracuse University? After I transferred to Syracuse University at the beginning of my sophomore year, I took my first Spanish course at SU with Professor Kathryn Everly. She has been such a great help to me in my years at SU and a wonderful professor with whom to learn Spanish. Additionally, Associate Professor Francine D’Amico of the international relations department has been especially supportive of me in my research and career goals. I look up to both of these strong and intelligent women as my academic role models. What other activities are you involved in while at Syracuse University? I work as a global ambassador for SU Abroad, representing programs in Strasbourg, France, and Madrid, Spain. Through SU Abroad, I have taken a position as a student representative on the faculty-led Working Group for the Internationalization of Curriculum. I am also the student representative on the SU faculty senate’s LGBT Concerns Committee, and I have served as a Dean’s Team member for the College of Arts and Sciences. Lastly, I was a member of the Spring 2016 Model United Nations team that traveled to NYC for the 2016 NMUN Conference, and I am a newly inducted member of the Phi Beta Kappa honor society. What are your career/research plans after graduation? At Syracuse University, I have focused my international relations studies on international law and organization (ILO), and more specifically, human rights law. I am currently in the process of applying for a Fulbright ETA Scholarship. Hopefully, if I receive this Fulbright, I will be in Spain for the year following graduation, as a teaching assistant in a high school English language classes and perhaps leading a Model United Nations project. Nevertheless, I plan to attend graduate school. Eventually, I will be fulfilling my Boren Award service requirement with a one-year job placement in the federal government. I am hoping to branch out further in the US government with a job in foreign service, with the Department of Defense or with the state department. What advice would you impart to future students studying modern foreign languages? My advice would be to study abroad as much as you can. Being able to live in French-speaking and Spanish-speaking countries truly allowed me to enhance my language skills, and with such immersions, I have developed my global competencies. I would definitely recommend studying abroad for at least a semester and a summer, if not two full semesters. What role do you think a liberal arts education plays in achieving career success? I think a liberal arts education permits undergraduate students to study a topic that they would not normally consider. This is a very valuable opportunity. For example, I had to take a nutrition course (NSD 225) to fulfill my last science requirement. I never expected to develop such an interest in the field of nutrition, particularly in the context of my major in international relations. I am now eager to study more about nutrition and food availability in the world as a type of human rights concern.